Plot 416, Tigris Crescent, off Aguiyi Irons! street, Maitama, P.M.B 138, Abuja. 1. The above named person with matriculation number xxxxxxx graduated from Delta State University with B ED. in Education/English in the year 2015. 2 However, these categories of graduate, Part-Time have been excluded from participating in the National Youth Service Corps by the Federal Government with effect from 2001. 3 In view of the above, she is hereby issued this letter of Exclusion. I am therefore directed to request you to give her all necessary assistance and recognition. 4. 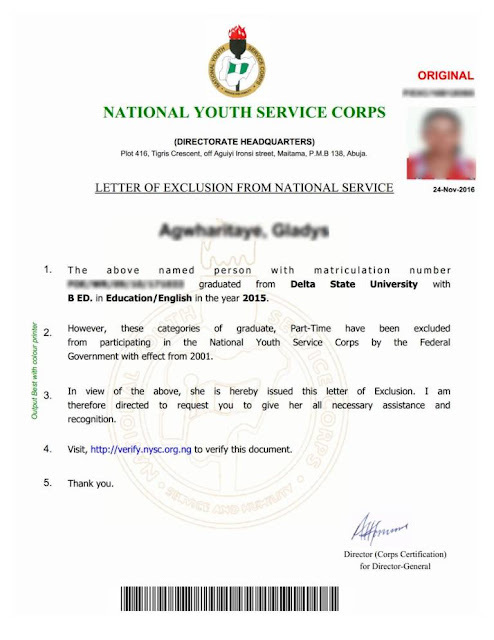 Visit, http://verify.nysc.org.ng to verify this document.